oUF_Bob is a oUF based layout thus this addon requires oUF to be awesome and provide you lots of bacon (though there are no guarantees of receiveing said bacon). That said oUF_Bob is a super flexible lightweight Unitframe replacement that is feature light. This current release is a beta version so please post any errors in the comments. oUF is provided in the download. This addon supports !Beautycase v2 only found with the Neav UI download page. It's not necessary but it is included with this addon and does actually work without it as well (graphical border is replaced with a pixel border). All config is found in the config.lua file there are no plans for an in game config at this time. 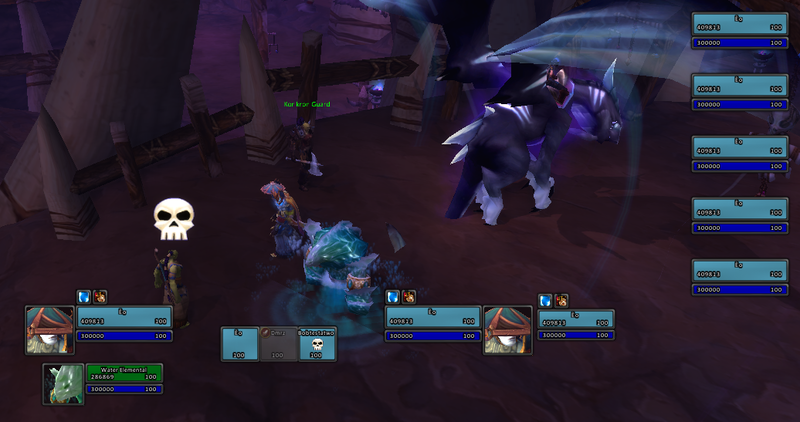 Groups frames are working properly, there are two position settings for healers and everyone else (positions are detected by spec) Heals defaults to middle of screen dps/tanks go off to the left side. adding embeds for Harmony, warlock, and shadow orbs holy power is included but it doesn't work. adding config option to disable group frames as raid frames still don't work right. Wow oUF has gone through some changes, this one is gonna be a small bit of an undertaking to get working again. Bear with me guys! Also oUF supports name plates now. Meaning that I'm going to look at baking them in! No thats for the spell steal ability mages have, oUF doesn't natively support dispellable debuffs and I never got that far into coding it. oUF_Bob is now listed with the MIT license no actual version changes. This is not the typical public domain style I use like with my simpler addons as this license still basically says "This addon belongs to me" but people are still free to redistribute oUF_Bob or parts of oUF_Bob. So I'm probably going to scrap group frames in general. I can get em to work right but I'm not finding a working example of Aurawatch that I can understand. posting a patch with a config option to disable group frames seeing as I still have yet to get the raid frames to work. I though I fixed that with the latest update. I'll do some checking later. But with this i get errors. The standalone is no longer updated which is why I use v2 you can only get it from the link I provided. I put in a request to see if I could provide that version with this addon but haven't got a response yet. For changing the font sizes I can add that in the config. Last edited by 10leej : 01-13-14 at 09:04 PM. Last edited by Zellglas : 01-13-14 at 09:41 AM. Mostly looking to have the 3d portrait able to be turned off entirely or the ability to remove any portrait at all, so its just the plain health / mana / power bar etc., if thats doable. Re: able to turn 3D portraits off? Love the Unit Frames w/built in xp/rep etc, works great. Only thing I was wondering howerver, is if there was a way to turn off the 3D portraits? Didn't see anything about portrait control in the config.lua unless I totally missed something. Any help would be greatly appreciated. Thx! Do you want a portrait in general or do you want no portraits at all because both can be done easily. able to turn 3D portraits off?